Basic B Complex consists of a group of eight water-soluble compounds: thiamine (vitamin B1), riboflavin (vitamin B2), niacin (vitamin B3), pantothenic acid (vitamin B5), pyridoxine (vitamin B6), cobalamin (vitamin B12), folate, and biotin. Although each B vitamin is chemically distinct, they often work together in various biochemical functions throughout the body – from cellular energy production, to healthy red-blood-cell formation, to healthy neurological function. Most B vitamins, with the exception of vitamin B12, are not stored in the body; consequently, they must be acquired daily from the diet in order to maintain optimal health. 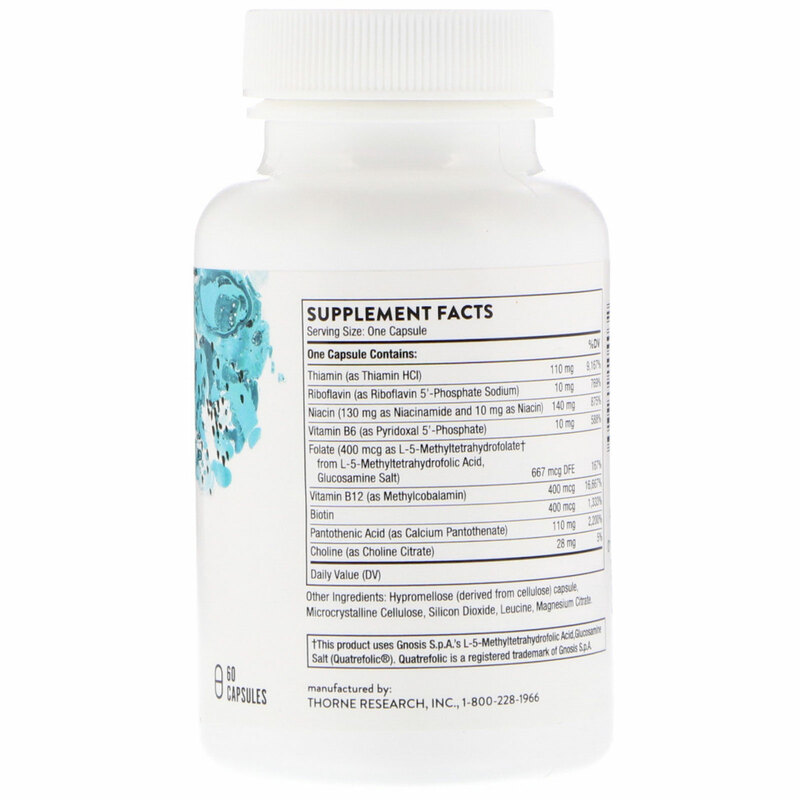 Supplementing with active B vitamins is extremely important to everyone, especially individuals who may not be able to convert non-active vitamins to their active forms in the liver because of compromised liver function, poorly functioning enzymes, digestive disturbances, or age. Dietary supplements containing these active cofactors have enhanced bioavailability, ensuring the body gets the nutrients it needs. 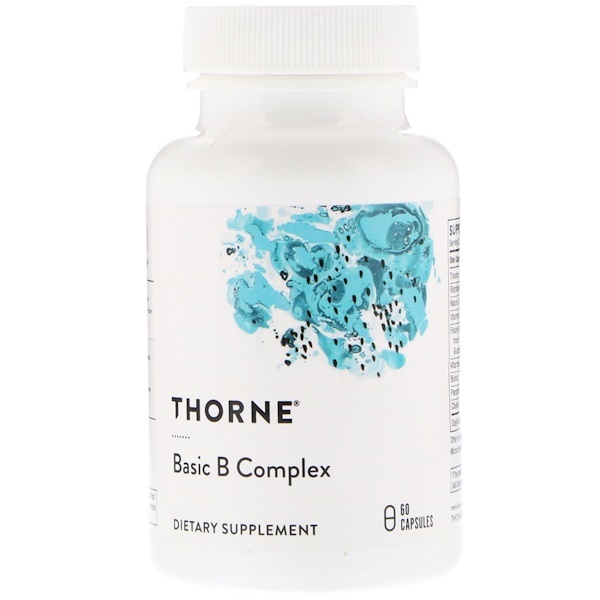 Thorne Research's Basic B Complex contains the entire B-complex, including the activated forms of vitamin B2 (riboflavin 5'-phosphate), vitamin B6 (pyridoxal 5'-phosphate), folic acid (L-5-methyltetrahydrofolate), and vitamin B12 (methylcobalamin), as well as 80 mg choline citrate. Although choline is often grouped with the B vitamin family, it is not officially a B vitamin. Hypromellose (derived from cellulose) capsule, microcrystalline cellulose, silicon dioxide, leucine, magnesium citrate.